The Rebel Sweetheart. : Foodie Goodie | Nutella Chocolate Chip Cookies. Yes, the Italian hazelnut-chocolate spread that we all know and love (because I don't know of a soul who does not like this sweet treat) has a special day marked in its honor. How awesome is that?! 2. In a stand or electric mixer, beat the butter and sugars until light and fluffy. Add eggs and vanilla, continue to beat until well combined. 3. Combine flour and baking soda in a bowl, then add slowly to wet ingredients along with the chocolate chips. 4. Scoop a large spoonful of dough and flatten it into the palm of your hand. 5. Add in some Nutella into the middle, about 1-2 tsp. Then fold cookie dough back up so that it seals and covers the Nutella entirely. 6. Bake for about 10-14 minutes or until edges are golden brown. 7. Remove and let cool for a few minutes before serving. As seen on Kirbie Cravings. This sounds so good...and easy! The perfect way to celebrate Nutella day. We'll have to try a batch! These cookies will be a great surprise for my son when he gets home from a school trip this weekend! These look amazing! Thanks for sharing your recipe! Yummy, these cookies sound delicious. I love Nutella. My kids got me hooked. Wow these must be really delicious! I love Nutella and will be giving these a go! These cookies look delicious! I love the taste of Nutella. I never thought of putting it in cookies. Brilliant!! Thanks for sharing the recipe! That's exactly what I need today! While eating dinner- we had a discussion with our kids- what they thing we should bake this weekend and they told me- chocolate chip cookies...but can you hide nutella or caramel inside :) I was sure there is a recipe for it somewhere! Thanks again! 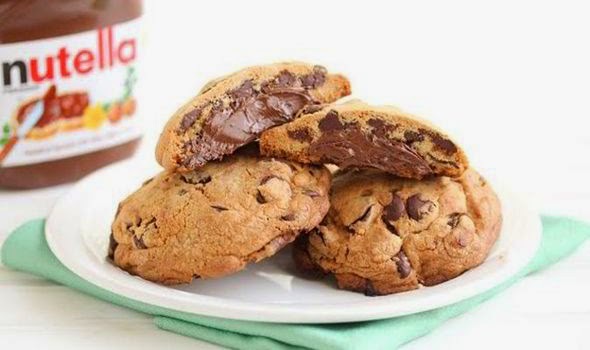 Never would have crossed my mind to use nutella with cookies, but oh yeah...count me in! Those cookies look incredible! I can practically taste the Nutella as I look at the picture! It took me so long to give Nutella a try. Even as it became mega popular, I hadn't even tried it until a few months ago, but am so glad I finally did. Need to make these! I had no idea that Nutella had a special day all to itself. Those cookies look delicious! I'd like some.